To access Jedox Integrator and, for example, execute Integrator projects from the Macro Engine in Jedox Web spreadsheets, two approaches are possible: 1) the macro can directly call the SOAP API of Jedox Integrator, or 2) two special wrapper functions, which abstract from the SOAP API layer, can be used. 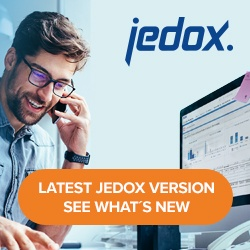 The SOAP API of Jedox Integrator can be addressed from Jedox Web spreadsheet macros (or any PHP environment) using the SOAP functionality provided by PHP. It can be used to check the current status of Jedox Integrator or execute a Integrator job from a spreadsheet (or PHP script), among other things. To access Jedox Integrator Server from PHP, you must first construct a SoapClient object that addresses the WSDL of Jedox Integrator. OLAP credentials or a valid OLAP session ID must be specified in the SOAP headers. For exception handling, we recommend wrapping the SOAP-specific parts of the code in try-catch blocks, and handling thrown exceptions of both specific SoapFault type and general Exception type. The $server resource then provides various methods to be executed on the Jedox Integrator Server. Note that before executing any following calls, you first have to execute the “login” method once, and set the resulting session as header on the $server object. Internally, Jedox Integrator Server will run this login against the Jedox OLAP Server it communicates with. The login method expects either a user and password, or a valid OLAP session ID (with key “olapSession”). If a valid OLAP session ID is passed, Jedox Integrator Server validates and re-uses this session and does not generate a new session on the OLAP Server. The “etlsession” header is then set and used for all subsequent requests on the $server object. The list will return a one-dimensional array containing the available projects. Similar to the list of projects, the list of jobs is returned as a one-dimensional array. Other components of an Jedox Integrator project, such as loads, or variables, can be accessed in a similar fashion, simply by changing the “.jobs” suffix of the “locator” argument to the component type that should be returned. // set the locator to be used for the execution, job with name "default" on project "sampleBiker"
The Jedox Integrator Server will return immediately after the execution has started. The returned object has several properties that can be accessed. The property “valid” is a Boolean value that specifies whether or not an error occurred on job initialization (“false”). The property “errorMessage” contains the error raised by the Jedox Integrator Server in that case. The most important property is “id”, the execution ID that was set by the Jedox Integrator Server. Using this ID, the status of the execution can then be queried (see below). This call would be feasible before executing a Jedox Integrator job, to check if that same job is already running or queued. The “waitForTermination” parameter specifies whether the server should return the status immediately (“false”), or, if the job is running, wait until it is finished and then return its final status (“true”). On the returned object, “statusCode” specifies the numeric status code of the execution; “status” is a textual representation of the status; and “errorMessage” specifies a detailed error message if an error did occur. The two wrapper functions simplify two common tasks: executing an Integrator project and checking the execution status of a project. To use the two wrapper functions, the macro code first requires the “integrator” code library. This is done to avoid integration of the code in macros that do not actually use it. First, the function will check if the job is already running at the moment. If this is the case, it will exit with a message indicating so. If this is not the case, then the function immediately returns the Job ID of the executed job. Additionally, the function offers a set of optional arguments that allow modifying its behavior. The second available function is called “integrator_set_job_status” and retrieves the status of a job (identified by its execution ID), and sets it to some resource in the spreadsheet, such as a cell or an @variable. The function returns an array with the two fields: “status_code” and “status_message”. Details on both wrapper functions can be found in the overview of the functions and objects exposed to the Macro Engine. This overview can be opened in a browser or downloaded as a zip archive.